1912 "The Ideal Stamp" Postcard to Sparkhill, Birmingham franked by a George V ½d, SG 340 , cancelled by a ROYAL HORTICULTURAL EXHIBITION cds. 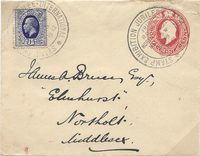 1912 George V 1d Red Stationery envelope to Northolt, Middlesex, also franked by a 1d Blue International Stamp Exhbiition stamp, both cancelled by ROYAL HORTICULTURAL EXHIBITION cds. 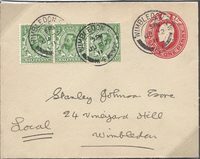 1934 George V 1d Red Stationery Post Card cancelled by "AIR POST EXHIBITION/LONDON/12 MAY 1934" together with an Air Post Exhbition stamp in Green which is cancelled by an "APEX 1934" cachet in Blue. 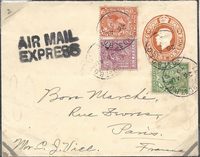 1913 ss CHEVALIER Postcard addressed to Glasgow franked by a ½d Green, SG 344, and tied by a very fine 3rd Type "G.K & ARDRISHAIG PACKET/B/CHEVALIER" circular datestamp, struck upright which is unusual for this. VERY RARE. 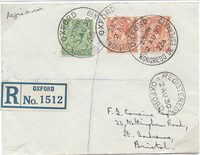 1914 O H M S Printed envelope addressed to London franked by a 1d, SG 357, tied by a FRENSHAM COMMON CAMP Skeleton datestamp. 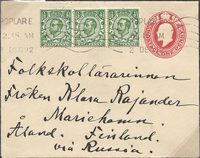 1912 1d Edward VII Stationery envelope to "Finland via Russia" uprated with a strip of three ½d GREEN, SG 340A, THE CENTRE STAMP with NO CROSS ON CROWN - unusual - to ALAND ISLANDS, FINLAND. 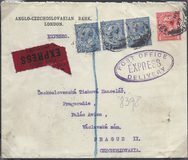 1924 2½d Blue, SG 422wi, WATERMARK INVERTED tied to 1930 envelope to Gosport by a PAQUEBOT-KINGSTON/JAMAICA cds, Hoskins Z402. 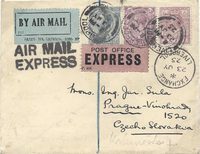 1916 ½d Green, SG 351, tied to postcard to Wallsend by a superb NORTH EASTERN T.P.O. UP cds, W 622, Index 'STN'. 1911 Postcard from Greenock to Manchester showing a superb R.M.S. "LORD OF THE ISLES" cachet in Violet. SUPERB! 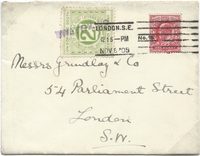 1915 ½d Green, SG 351, tied to postcard to Southport by a very fine "G. K. & ARDRISHAIG PACKET/IONA". Code 'B' Afternoon, 27 mm cds. 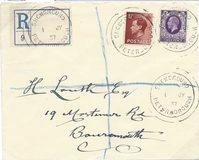 1924 MIS-CUT 1d GEORGE V POSTCARD addressed to Bridgnorth and cancelled by a very fine HALESWORTH/SUFFOLK CDS. Unusual. 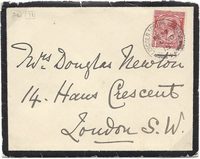 1835 ½d Green Stationery envelope to Kingston, Surrey, franked by two 1d Scarlet, SG 419 and tied by HOLLAM DN BARN/CAMP HANTS skeleton circular datestamps. 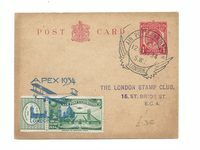 9th Sept 1911 Official Celebratory FIRST UK AERIAL POSTCARD LONDONB-WINDSOR BOX 3 addressed to Norwich. 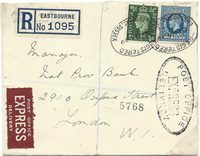 1911 ½d GREEN, DIE 1A, PERFORATION 14, SG 322A, tied to Postcard to London by a very fine GREAT-YARMOUTH cds - VERY SCARCE PERF 14.